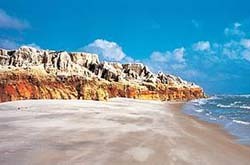 The Municipality of Beberibe includes a 54 km stretch of Ceara's coastline including Praia das Fontes and Morro Branco! Words like indescribable, incomparable could all apply in ones best efforts to describe the natural beauty of these beaches that will inspire you to to explore the entire coast. 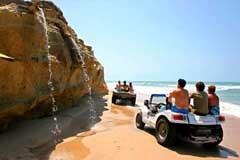 The Falesias take the form of natural monuments along Praia das Fontes and Morro Branco adding a new dimension to Ceara's unique and relatively undiscovered shores. The Praias of Beberibe make a perfect stop for visitors traveling south from Fortaleza.Almost exactly halfway between the capital and Canoa Quebrada and with the appropriate accommodations for the backpacker, families, or couples on a romantic getaway!Along the main beaches there are good "Barracas" restaurant-bars , pousadas and hotels to choose from. Praias of Beberibe also include Praia de Uruau,Praia de Tabuba, Sucatinga, Praia dos Anjos, and others. Each one one with its own unique beauty and characteristics.There are those that border on nothing but endless desert,still preserved in their natural state. The local artists meticulously re-create Beberibe beach landscapes using multi colored sands in transparent jars. Only 5 km from Beberibe. 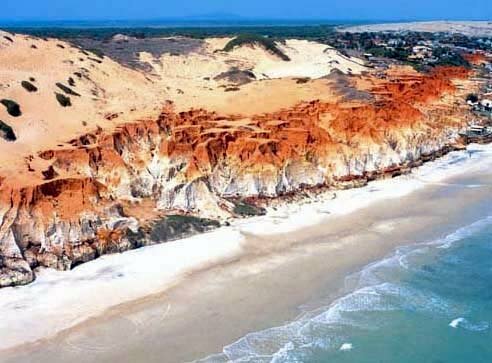 The Praia do Morro Branco is internationally famous for cliff formations that run the entire length of the beach. The erosive effect of the winds and water on the sand have come together to create multi colored layers in the sedimentary rock that makes up what all call "falesias" in Portuguese. fines for anyone causing damage to the cliffs. Located 87 km from the state capital, Praia das Fontes is known for its calm seas and white sand. Is still inhabited by a colony of fisherman. Landscapes which have been featured in countless Brazilian films and soap operas over the years! 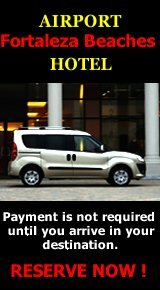 The beach is completely surrounded by the dunes, and multi colored cliffs along with fresh water springs and Lake Uberaba. 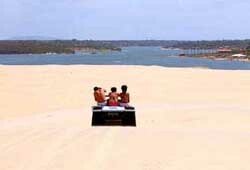 One of the main attractions in Beberibe is the buggy rides over the Sahara like dunes. 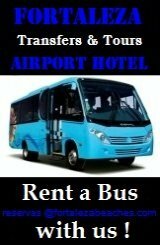 their services in front of Hotel Parque das Fontes. 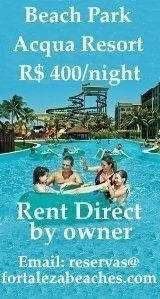 Just beyond Praia das Fontes is Praia do Uruau and the lake that bears the same name, "Lagoa do Uruau".One of the largest lakes in Ceara and a local favorite for just about every water sport imaginable including Jet Ski and water skying and Scuba . In recent years Scuba Divers have been exploring the Uruau Channel and the sites of two shipwrecks the "Remedios" and the "Siquiera Campos". The lakes shoreline is surrounded with beautiful summer homes and "Barracas" Bar Restaurants famous for serving fresh seafood dishes and ice cold drinks! Stretches from just beyond Morro Branco to the banks of the "Rio Choro" and the borders of the Municipality of Cascavel. Praia da Tabuba's waters are always crystal clear and you will often encounter unusually large waves a phenomena the locals call "pororoca", provoked by the floods of the river. Only 7 km from Beberibe, Sucatinga is a picturesque little fishing village completely surrounded by huge sand dunes with the jangadas lined along the beach.The friendly inhabitants still live almost entirely from the fruits of the mar. 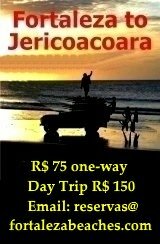 Praia dos Anjos lies within the boundaries of Sucatinga, approximately 7 km from the entrance to Beberibe. Where the scene for the Globo Network TV program "No Limit" was filmed. A paradise for those who like to walk in the dunes, motocross, or 4X4 off road adventures! There is a very little tourism activity here. The beach is an ecological refuge. The village has not been exploited by tourism. The inhabitants dwell amongst the dunes, lagoons and coconut trees. This is a totally deserted beach, located between the Lagoa Corrego do Sal and the Lagoa do Correia. The ocean has a strong under tow here making it difficult for swimming while the sunset over the Lagoa Paripueiras and the beach can be incredible! Where the sea cliffs reappear with fresh water springs arising just a few meters from the sea. The local community survives directly from their natural resources and tourism. Is a quiet tranquil place known for it strong currents, crystal clear water and good fishing. Clear calm waters, coconut trees, near with Lagoa do Canto where you will find a village inhabited by natives behind the cliffs. Survive by fishing and making handicrafts.